Four D.C. dogs will be competing this week in a dog show, but it's no ordinary contest. The four shelter dogs from the Washington Area Rescue League, as well as dogs from three other local shelters, will be competing online from Thursday through Sunday in the first “Best in Shelter” Virtual Dog Show. The first-place dog will win $50,000 for his or her shelter. All competing dogs are available for adoption. The four dogs representing the Washington Area Rescue League each have a video online, which can be voted for once a day by the public. 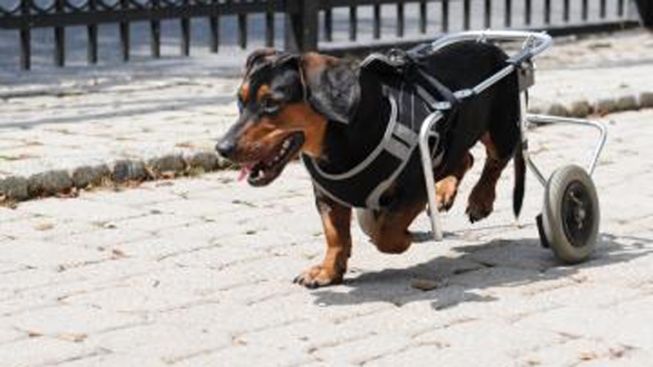 Buster, a Dachshund mix, was rescued at the age of 6 months after being hit by a car. He is now 13 months old, and uses a custom set of wheels to get around. Bella is a 7-year-old Chihuahua, who likes to switch between snoozing and dancing. Hooch is a black and brown, larger dog who is especially people-friendly. And Max is a 1-year-old Carin Terrier mix who loves toys. The Best in Shelter event was created by mystery author Martha Grimes. She was inspired by the animal rights commercials she often saw during televised dog shows. “We want to blot out the stereotypes of shelter animals as being the opposite of show dogs -- as being untrained, unkempt, unworthy,” Grimes said on the event’s website. Grimes hopes that the event will lead to the support and adoption of shelter dogs. Three other area shelters -- Animal Welfare League of Arlington, Lost Dog and Cat Rescue Foundation, and the Washington Humane Society -- have each entered four just as adorable dogs in the competition. The top dog wins $50,000 for its shelter. Second place wins $25,000 for its shelter, and third prize is $15,000. To vote starting June 14 or for more information, visit http://www.bestinshelter.org.